The Williams Legato III is a full-size digital piano with 88 touch-sensitive keys, Bluetooth MIDI capabilities, an iOS app and two improved built-in speakers. More than just a great-sounding instrument for playing, practicing and performing, the Legato III includes sounds from the incredible Williams Custom Sound Library featuring a collection of impressive piano and vintage keyboards. With its Bluetooth MIDI function, it connects wirelessly to your iPhone or iPad and can run on batteries or with the included AC supply. 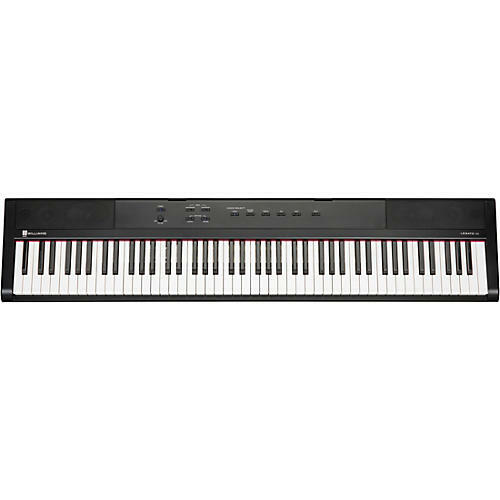 The Williams Legato III is a great piano for the beginning musician. Buy it for yourself or for the novice player in your life. The Williams Legato III is a full-size stage piano and controller with 88 touch-sensitive keys that respond to your playing dynamics. The velocity-sensitive response is also great for advanced players to unleash their creativity and play with detail and expression. The Williams Digital Pianos took a huge leap forward with the development of their custom sound collection—The Williams Custom Sound Library. Their sound design team looked far and wide for world-class keyboards, which would exceed all expectations for the library and they succeeded. The Legato III comes with 10 sounds including piano, electric piano, organ, synth and bass. The quality of the sounds have a warm tone and sound great through the built-in speakers. The sounds have a clear resonant tone and are realistic enough to satisfy the most discerning player. The Legato III’s Bluetooth MIDI function connects wirelessly to smartphones, tablets, or computers. Control iPad apps like Garage Band or interact with educational software like McCarthy Music. A USB port is also provided for direct connection to a computer. Use the Williams app for iPhone and iPad to audition sounds, split and layer the keyboard, and adjust effects like reverb, chorus, and tremolo. Play music from your iTunes library at slower speed without changing the pitch to learn new songs. Practice along with drum machine patterns, jam sessions, or a metronome.